I’m not one to make a big deal out of Halloween celebrations – I’d rather celebrate Reformation Day! However, I had some great supplies in my October Paper Pumpkin, and I thought my grandmas would probably like a friendly little hello in their mailboxes, so these are the cards I came up with. I used the “Eat Something Sweet” sentiment from the Paper Pumpkin box on the inside of each of them. As I mentioned in my last post, I’m not sure if I need different watercolors to get darker colors, but my purple/orange sunset didn’t end up nearly as “spooky” as I had hoped. I used watercolor paper for the bottom and wet embossed the trees in black. 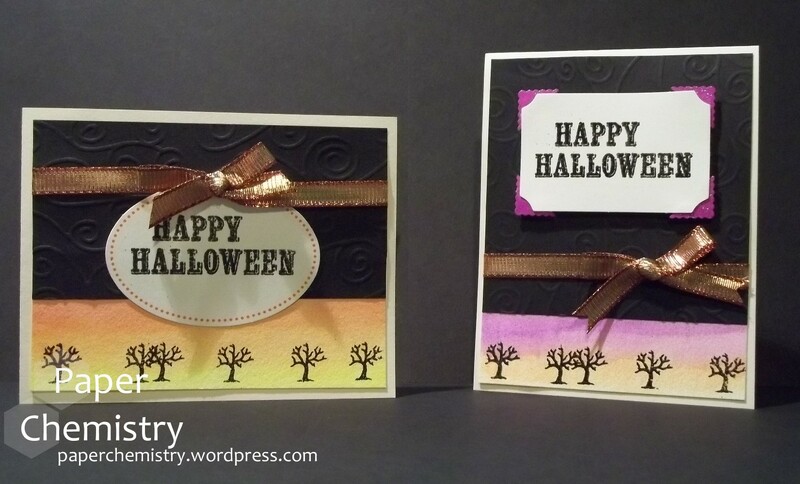 The swirl dry embossing on the black card stock was from a texture plate by Sizzix, and the ribbon was in my stash.